We're just over four days into the High Summer Read-a-Thon, and I've made some really good progress since my last update. I've been reading like crazy! In the first two days, I read 84 pages of The Mists of Avalon, and in the two days since, I've read another 153 pages, bringing me to a total so far of 237 pages read! Not too shabby! That means I only have 119 pages left, so it's definitely possible that I'll finish The Mists of Avalon AND read The Wish List before this read-a-thon is done. 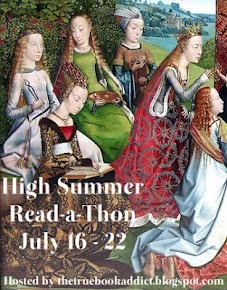 Whether I reach that goal or not, I already consider this read-a-thon to be a success! Oh, and there's another Twitter chat tonight, which I will hopefully participate in. (At the last one, I was on the bus home from work during part of it, and ended up missing the whole thing because I got distracted on the way home and bought a book and a Slurpee.) Tonight's Twitter chat is from 8 to 9 pm central time, and I'll be tweeting as @TheToweringPile.